Five is a very, very big number. Five is when you can go potty on your own. Five is when you start dabbling with your own imagination and the boundaries of truth and fiction. Five is when you begin discovering the importance of helping people. Five is precociousness, play dates and praise for good behavior. Five years in to this blogging thing, and I think I've hit a good rhythm. I enjoy using this space to share my ideas and perspective of the world. I also like to step up on the splintered soapbox from time to time, pontificating and waxing poetic about life's elements that I feel deserve some attention, recognition or consideration. I've used this blog to be precocious, arrange play dates and otherwise demonstrate good behavior. I've dished out (a little) fiction and a lot of honesty, and somehow you all still seem to like me. As self indulgent as this blog is - I really strive to give you some legitimate, thought provoking content. As the title indicates - everything is random and whimsical, but I really hope there's a nugget or two to glean in each and every post. Maybe it's a smile, a thought, a feeling of shared empathy. Maybe you're inspired to try a new recipe or dream about a new place. Whatever the case may be, I hope you enjoy discovering life along with me. Final note - if there's something you'd like me to blog about, try out, explore, investigate, pontificate, reveal, etc., let me know. I'm happy to oblige. P.S. - Another significant milestone is on its way in the next couple days. I apologize in advance for any silly fanfare or celebration my vanity orders me to display. congrats on turning five and here's to another five! So fabulous to meet you in Chicago!! I'll have to figure out the Cincy Women Bloggers thing soon. 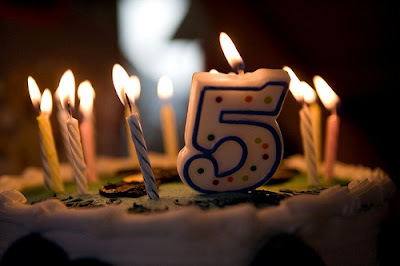 5 Years is a great milestone for blogging which I believe most people do for about 3 blog posts.